Abstract. Leptin, secreted from fat cells, functions as a lipostat mechanism through modulation of satiety signals. Markedly elevated leptin levels have been documented in uremic patients, especially in those who are treated by peritoneal dialysis (PD). However, the role of hyperleptinemia in uremic patients is not clear, and it is not known whether elevated leptin levels contribute to uremic anorexia and changes in body composition. In this prospective study, serum leptin, C-reactive protein (CRP), plasma insulin, and body composition (dual-energy x-ray absorptiometry) were measured in 36 patients (53 ± 1 yr) close to start and after about 1 yr of PD. In addition, markers of dialysis adequacy and urea kinetics were followed during treatment with PD. During PD, the total body fat mass (20.5 ± 1.0 to 22.9 ± 1.3 kg ; P < 0.01), truncal fat mass (11.5 ± 0.7 to 13.2 ± 0.9 kg ; P < 0.001), and serum leptin levels (20.1 ± 3.8 to 35.6 ± 6.8 ng/ml ; P < 0.01) increased markedly, especially in patients with diabetes mellitus. Twenty-five PD patients that lost lean body mass during PD had significantly (P < 0.05) elevated initial CRP levels (14 ± 2 mg/L) compared to 11 patients (<10 mg/L) who gained lean body mass during PD. A significant increase in serum leptin levels (20.9 ± 4.2 to 42.7 ± 4.0 ng/ml ; P < 0.001) was observed in those patients who lost lean body mass, whereas no such change (18.4 ± 8.4 to 19.2 ± 6.4 ng/ml) was observed in the patients that gained lean body mass during PD treatment. The present longitudinal results demonstrate that serum leptin level and body fat content increase markedly during PD, especially in diabetic patients. Patients that lost lean body mass during PD had higher initial CRP levels and increased their serum leptin levels significantly during PD compared to those patients that gained lean body mass. Additional studies are therefore needed to elucidate the role of hyperleptinemia and inflammation in causing anorexia, protein-malnutrition, and changes in body composition during treatment with PD. Peritoneal dialysis (PD) is a valid method of treatment for chronic renal failure (CRF) but may induce several metabolic conditions that could worsen the nutritional status of the patient. Among them are the continuous glucose absorption from the dialysate, which may cause an increase in body fat mass (1,2,3) and protein losses into the dialysate (4), which may contribute to protein malnutrition. Leptin, the product of the adipose-specific ob gene, regulates food intake and energy expenditure in animal models. It has also been found that the serum leptin concentration is a good marker of the amount of body fat in obese patients (5), as well as in nonobese patients with CRF (1). Treatment with recombinant leptin induces dramatic weight reduction in mice (6). It is thought that leptin reaches the brain and via direct effects on the hypothalamus decreases appetite and increases metabolism. Several recent studies (1, 7,8,9,10) have demonstrated an inappropriate elevation of circulatory leptin in uremic patients, and it could be speculated that hyperleptinemia may be one factor that induces anorexia and weight loss in CRF. The relationship between leptin and body compositional changes in uremic patients is important to study, because the role of leptin in regulating nutritional intake and energy expenditure has not been clarified. There is still no direct proof of loss of appetite with an increase in leptin levels in uremic patients, as available cross-sectional data in the literature are conflicting. Although some studies have presented data that are consistent with the concept that leptin contributes to malnutrition (9, 11), others have not been able to demonstrate any relationship between serum leptin and recent weight change or various nutritional markers (7, 8). However, conclusions based on cross-sectional data are bound to be incomplete and will miss the regulatory and dynamic effects that leptin might have in the early development of changes in body composition (12). Longitudinal studies with serial measurements of leptin and body composition are therefore required to better study the dynamics and potential clinical relevance of the leptin system in CRF patients. The aim of the present prospective study was therefore to study longitudinal changes in body composition during PD and to relate the changes in body composition to changes in serum leptin levels. Fifty-one patients were enrolled in this prospective study. However, due to renal transplantation (n = 7), death (n = 7), or switch to hemodialysis treatment (n = 1), only 36 patients (22 males and 14 females) completed the study and were evaluated. Their mean age (SEM) before the start of PD was 53 ± 1 yr and body mass index (BMI) was 24.1 ± 0.6 kg/m2 (range, 17.3 to 34.1 kg/m2). The cause of CRF was diabetic nephropathy in 10 (28%) patients (6 type 1 diabetes mellitus), chronic glomerulonephritis in 14 patients (39%), polycystic kidney disease in three patients (8%), interstitial nephritis in three patients (8%), and other or unknown etiologies in six patients (17%). The level of residual renal function, estimated by creatinine clearance (CCr) before the start of PD, was 7.3 ± 0.3 ml/min. Most patients were taking antihypertensive medications (beta-blockers, calcium channel blockers, furosemide, and angiotensin-converting enzyme inhibitors) and other commonly used drugs in terminal CRF such as phosphate and potassium binders, as well as vitamin B-, C-, and D supplements. After an overnight fast, blood samples for the analysis of C-reactive protein (CRP), creatinine, urea, plasma insulin (n = 26), and serum leptin were taken at a time point shortly before the start of PD. Measurements of body composition by dual-energy x-ray absorptiometry (DEXA), weight, and length were also performed in all patients. DEXA was performed 20 ± 7 d (range, 48 to 156 d) after the start of PD and always after drainage of the peritoneal dialysate. Repeated measurements of body composition, weight, and length, fasting serum leptin, and CRP were performed 391 ± 9 d after the patients had started PD. Because changes in the hydration status may be a factor confounding the estimation of lean body mass by DEXA, serial multiple-frequency bioimpedance measurements were performed to estimate the extracellular volume (ECV) in 15 of the patients. Thirty-four of the patients were initially treated with continuous ambulatory peritoneal dialysis (CAPD), whereas two of the patients were initially treated with automated peritoneal dialysis (APD) using a cycler. The prescribed dialysate volumes were individualized, and two more patients were transformed to APD during the study period. The Ethics Committee of Karolinska Institute at Huddinge University Hospital approved the study. All patients gave informed consent to participate. Weekly Kt/V urea and weekly CCr (L/wk 1.73 m2) were calculated from a 24-h collection of dialysate and urine. The distribution volume of urea, which is generally assumed to be equal to total body water, was calculated with V, estimated from the Watson equation (13). Weekly CCr was calculated as peritoneal CCr plus the average of renal urea and CCr. The residual renal function (RRF) was calculated as the average of residual renal creatinine and urea clearances. Dietary protein intake was estimated from the protein equivalent of nitrogen appearance (PNA) using the recently derived equation : PNA = 15.1 + 0.195 urea appearance (mmol/24 h) + protein losses (g/24 h). Urea appearance rate and protein losses were determined from the measured urea and protein excretion in dialysate and urine (14). PNA was normalized for actual body weight to obtain nPNA (g/kg body wt/24 h). The 24-h peritoneal glucose absorption was calculated from the used dialysate volumes and glucose concentrations during 24 h minus the directly measured volume and glucose concentration of the drained 24-h dialysate. The average values of total protein loss, Kt/V urea, weekly CCr, RRF, PNA, nPNA, and 24-h glucose absorption from all of the 24-h collections of urine and dialysate in each patient (n = 3 to 6) during the first year of PD were used in the statistical analysis. Serum leptin levels were analyzed with a commerically available RIA kit (Linco Research, Inc., St. Charles, MO). The leptin assay is completely homologous, since the antibody was raised against highly purified human leptin and both the standard and tracer are prepared with human leptin. The coefficient of variance within the sample was 6%. A specific RIA assay was used to analyze plasma insulin (Pharmacia, Uppsala, Sweden). Determinations of CRP, creatinine, and urea were carried out in the Department of Clinical Chemistry, Huddinge Hospital, using routine methods. The detection limit of CRP at the Department of Clinical Chemistry, Huddinge Hospital is 10 mg/L, and all values <10 mg/L in the statistical evaluation were treated as 5 mg/L. All subjects had their body composition evaluated by DEXA (Lunar Corp., Madison, WI) with Lunar software, version 3.4. At the same time as the DEXA investigation, ECV was estimated in 15 of the patients by multiple-frequency bioimpedance as described previously (15). All results are given as mean ± SEM. The nonparametric Mann-Whitney U test or unpaired t test was used to test differences between patients who lost or gained lean body mass, as appropriate. The nonparametric Wilcoxon rank sum test or paired t test was used to evaluate differences over time, as appropriate. Correlations were tested by regression analysis or the Spearman rank (rho) test, as appropriate. Independent associations between one dependent variable and more than two independent variables were assessed by a stepwise multiple regression analysis. Because CRP is not a normal-distributed variable, the multiple regression analysis was performed on log-transformed CRP values. A two-tailed P value <0.05 was considered statistically significant. All body compositional data and serum leptin levels before and after PD are shown in Table 1. Significant increases in BMI, body fat mass, and truncal fat mass were observed, whereas the lean body mass decreased significantly in the whole patient group. However, when divided into diabetic (n = 10) and nondiabetic (n = 26) patients, respectively, no significant decrease in lean body mass was observed in nondiabetic patients, whereas a significant (P < 0.01) decrease in lean body mass was observed among the diabetic patients (Table 1). On the other hand, the diabetic patient group tended to gain more body fat mass compared with nondiabetic patients (Table 1). In 15 patients, examined by both DEXA and multiple-frequency bioimpedance, lean body mass decreased significantly (48.1 ± 3.1 to 45.2 ± 2.7 kg ; P < 0.01), whereas no significant change was observed in ECV (19.2 ± 1.3 to 18.5 ± 1.2 L) during PD. No significant correlation (r = 0.26) was observed between changes in lean body mass and changes in ECV during PD. Serum leptin levels tended to be higher in women (28.0 ± 8.6 ng/ml) than in men (15.2 ± 2.7 ng/ml), although the difference did not reach statistical significance. However, the serum leptin to body fat mass ratio was significantly elevated (1.2 ± 0.3 versus 0.6 ± 0.1 ng/ml per kg ; P < 0.05) in women. As expected, strong positive relations were found between serum leptin and both body fat mass (rho = 0.74 ; P < 0.0001) and BMI (rho = 0.52 ; P < 0.01), respectively. Initial serum leptin levels also correlated with plasma insulin levels (rho = 0.55 ; P < 0.01 ; n = 26), but not with age, lean body mass, or CRP. Patients were also divided into two groups as follows : those who gained lean body mass (1.1 ± 0.3 kg ; n = 11) and those who lost lean body mass (-3.0 ± 0.5 kg ; n = 25) during treatment with PD (Table 2). Interestingly, none of the patients that gained lean body mass during PD had elevated initial CRP levels, whereas the mean CRP was significantly higher in those patients that lost lean body mass during PD treatment. A significant positive relation (rho = 0.46 ; P < 0.05) was observed between initial CRP and the change in serum leptin levels during PD (Figure 1). 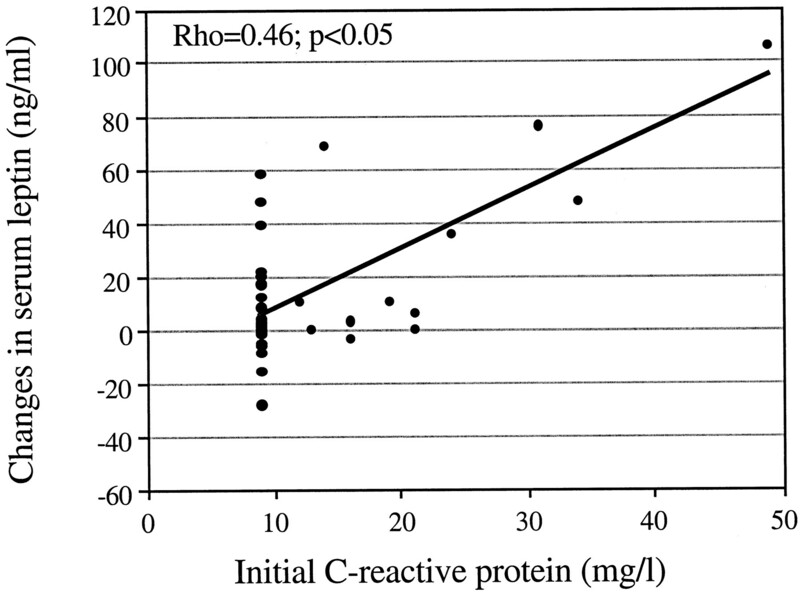 Initial CRP levels correlated significantly (rho = 0.73 ; P < 0.01) with CRP levels at follow-up. Although serum leptin levels increased significantly (P < 0.001) in those patients who lost lean body mass (mean 20.9 ± 4.2 to 42.7 ± 4.0 ng/ml ; median, 11 to 28 ng/ml), no significant changes in serum leptin levels (mean, 18.4 ± 8.4 to 19.2 ± 6.4 ng/ml ; median, 8 to 9 ng/ml) could be observed in those patients who gained lean body mass during treatment with PD (Figure 2). A highly significant positive correlation (r = 0.71 ; P < 0.0001) was observed between changes in serum leptin and body fat mass during PD treatment (Figure 3). 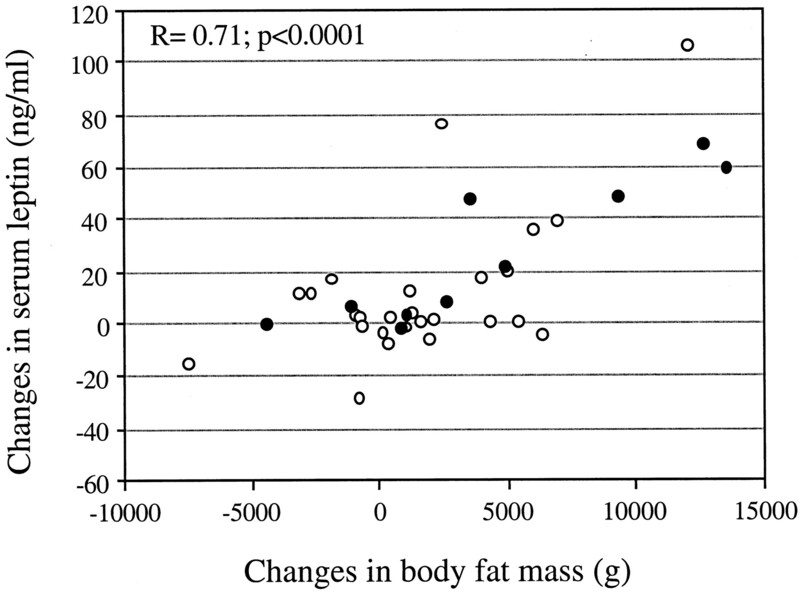 The changes observed in lean body mass during 12 mo of PD correlated negatively with changes both in serum leptin (r = -0.41 ; P < 0.05) and the leptin : body fat ratio (r = -0.40 ; P < 0.05), as shown in Figure 4. Initial plasma insulin levels correlated positively (r = 0.40 ; P < 0.05 ; n = 26) with the changes in serum leptin during PD treatment. The prevalence of diabetes mellitus did not differ significantly between the two groups. Relation between initial C-reactive protein levels and changes in serum leptin during peritoneal dialysis (PD) treatment (rho = 0.46 ; P < 0.05). Serum leptin levels before and during PD in patients that lost (n = 25) or gained (n = 11) lean body mass during treatment with PD. Correlation (r = 0.71 ; P < 0.0001) between changes in serum leptin and total body fat mass in diabetic (•) and nondiabetic (○) patients treated by PD. Correlation (r = -0.40 ; P < 0.05) between changes in the serum leptin to body fat ratio and changes in lean body mass in diabetic (•) and nondiabetic (○) patients treated by PD. All peritoneal adequacy and urea kinetic parameters in patients that gained or lost lean body mass are shown in Table 3. Significant negative correlations were observed between nPNA and changes in serum leptin (r = -0.38 ; P < 0.05) and the leptin : body fat ratio (r = -0.38 ; P < 0.05), respectively. However, when nPNA was corrected for BMI these relations did not attain statistical significance. The peritoneal glucose absorption correlated significantly (r = 0.35 ; P < 0.05) with changes in serum leptin in a univariate regression analysis. A stepwise multiple regression model (in which plasma insulin was not allowed to enter due to only 26 observations) demonstrated independent associations between changes in serum leptin and changes in both body fat mass (P < 0.0001) and log CRP (P < 0.0001), respectively (Table 4). In another stepwise multiple regression analysis (Table 5), an independent association (P < 0.01) between changes in lean body mass and the presence of diabetes mellitus was found, whereas a near-significant (P = 0.07) association was observed between changes in lean body mass and changes in serum leptin during PD. Stepwise multiple regression model with changes in serum leptin as the dependent variableaCRP, C-reactive, protein. This study demonstrates that PD is associated with a marked increase in serum leptin levels. This confirms several previous cross-sectional studies in which markedly elevated serum leptin levels have been demonstrated in PD patients (8,9,10, 16). There are probably several reasons why leptin levels increase so much after the commencement of PD. 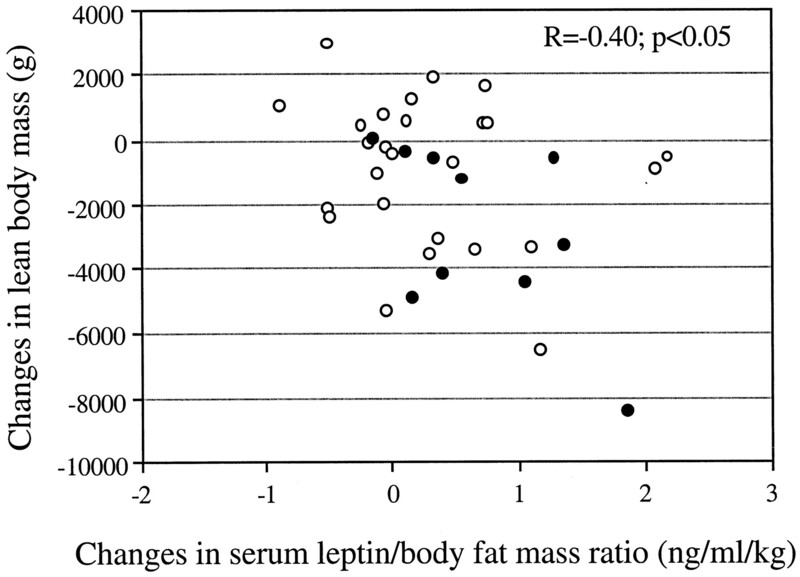 At first, in view of the strong correlation between the increment in serum leptin and body fat content, it is likely that the increase in body fat mass is the most important cause of increased serum leptin levels (Figure 3). Indeed, leptin is almost exclusively produced in adipose tissue, and leptin mRNA has been shown to correlate with the amount of body fat (17). However, because the serum leptin : body fat mass ratio increased significantly during PD treatment (Table 1), it is probable that factors other than increased body fat content also contribute to the elevated leptin levels. In PD, it is well documented that the continuous glucose load will result in chronic hyperinsulinemia, which in this context is of interest as insulin has been shown to regulate leptin gene expression. It has been demonstrated that plasma leptin levels increase by about 40% following chronic (18), but not acute (18, 19), hyperinsulinemia. We have demonstrated previously that serum leptin levels correlate with plasma insulin levels independently of the body fat mass (20), and in the present study we found a significant positive correlation between initial insulin levels and changes in leptin. Thus, our findings are in agreement with the concept that hyperinsulinemia may stimulate leptin production. The significant positive correlation between initial CRP and the increase in serum leptin levels as demonstrated in present study suggests that inflammation may be another factor that contributes to hyperleptinemia (Figure 1). Since elevated levels of proinflammatory cytokines are a common phenomenon in PD (21), it is tempting to speculate that a low-grade inflammatory process may contribute to the stimulation of leptin mRNA and thereby increase the circulating leptin levels. Indeed, Nordfors et al. (22) have observed elevated leptin mRNA levels in CRF patients with an inflammatory response. Also, in animal studies it has been demonstrated that cytokines raise leptin mRNA levels (23,24,25). However, not all studies have found an association between inflammation and elevated leptin levels in humans, and additional studies are needed to clarify whether a low-grade inflammatory response may increase serum leptin levels in PD patients. In the present study, DEXA was used to assess body composition, and with this technique measures of bone mineral, fat, and lean body mass are directly estimated without making assumptions of the two-compartment model (26, 27). It has been demonstrated that DEXA is superior to other simple noninvasive methods for determining body composition in renal failure, particularly when emphasis is made on repeated measurements (28, 29). However, it must be noted that the estimation of lean body mass may be confounded by changes in hydration status. To evaluate this possibility, serial measurement of multiple-frequency bioimpedance was performed in a subset of patients, and our results suggest that changes in the hydration status could not explain the observed changes in lean body mass over time. Our findings are in accordance with a recent study (3), which concluded that there may be a risk of reduction of body cell mass (as estimated by total body potassium), but not total body water (estimated by tritiated water), during long-term PD treatment. The reason(s) for the decrease in lean body mass during PD are not evident but are probably multifactorial. At first, it is likely that a continuous protein loss into the dialysate (4) may contribute to a negative protein balance. Moreover, a low eating drive has been demonstrated in PD patients despite a need for protein and calories (30). The reason(s) for the loe eating drive in PD patients are not known, but in view of the appetite-inhibiting effects of leptin, it is tempting to speculate that hyperleptinemia may be one contributing factor. 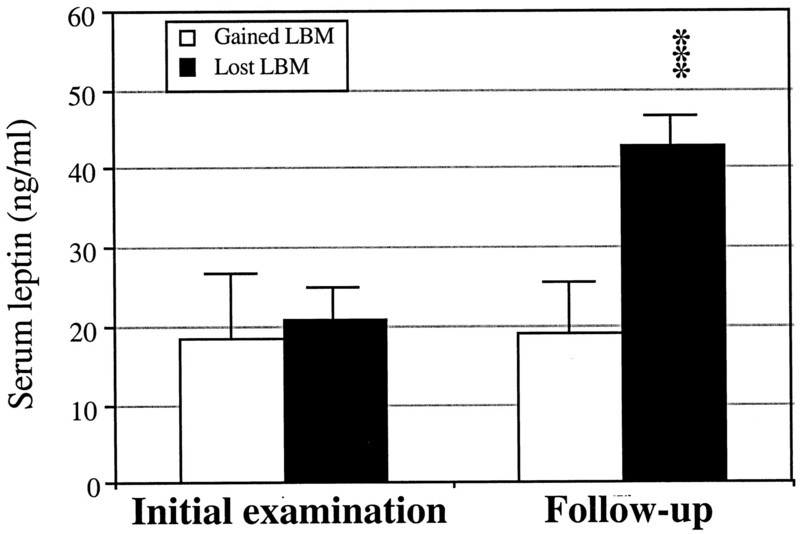 It is notable that PD patients that lost lean body mass exhibited a marked and significant increase in serum leptin levels in contrast to the PD patients that gained lean body mass (Figure 2). Our results support those recently presented by Odamaki et al. (11), who demonstrated that high levels of serum leptin relative to the body fat mass were associated with weight loss in hemodialysis patients. Moreover, an association of increased leptin levels with a low protein intake and loss of lean body mass (9), as well as a significant correlation between leptin levels, serum albumin, and the protein catabolic rate (16), has been observed in dialysis patients. However, others have found no association between the leptin concentration and recent weight change or nutritional status in CRF (7, 8). Thus, at present there is some evidence from cross-sectional studies indicating that elevated leptin levels may mediate anorexia in CRF, but it is obvious that longitudinal studies are needed to substantiate this proposal. However, it should be pointed out that future studies addressing this problem might not be fruitful unless they progress beyond the observational and correlative studies that have been performed thus far. In summary, the present study has demonstrated marked increases in both body fat mass and serum leptin levels during PD treatment. Our data suggest that not only an increased body fat mass, but also a low-grade inflammation may contribute to increased leptin levels during PD treatment. We have also demonstrated that PD is associated with a loss of lean body mass, especially in patients with diabetes mellitus. The reason(s) that patients on PD lose lean body mass are not clear but are probably multifactorial. Because the results of the present study suggest that serum leptin may be a contributing factor, additional longitudinal studies are necessary to elucidate whether hyperleptinemia may lead to a low eating drive during treatment with PD. This study was supported by the Swedish Medical Research Council (K98-19X-12676-01), funds from the Karolinska Institute (Dr. Stenvinkel), the Karin Tryggers Fund (Dr. Stenvinkel), and the Baxter Extramural Grant Program (Dr. Stenvinkel). We acknowledge the skilled technical assistance of Inger Sjödin, Ann Lif, Bertha Johansson, Eva Sjölin, and Kerstin Wåhlén. Is des-acyl ghrelin contributing to uremic anorexia?